Can Natalie Haynes and her team make it out of The Escape Room? Escape Rooms are immersive, live games where groups of players are locked in a confined space and must solve puzzles to escape in time. Games are often themed. Players can flee penitentiaries, Egyptian tombs or pirate ships. Five years ago, there were only a handful in the UK. Today, there are nearly a thousand. In an attempt to understand this phenomenon, the writer and broadcaster Natalie Haynes is the latest person to be locked in. Her team has one hour to complete a series of tasks. While searching for clues, she’ll also try to find out what’s fuelling our fascination for escape. 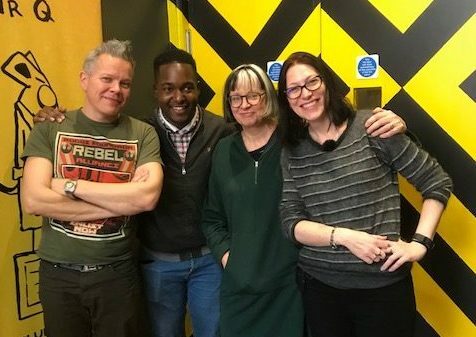 Natalie’s team is made up of psychotherapist Philippa Perry, digital entrepreneur Bejay Mulenga and comedian and puzzle enthusiast Rob Deering. They’ll be observed from afar by Hungarian escape room founder Zoltán Papp and the writer Laurence Scott.